11 pages of Pictures, diagrams and explanations detailing this small basic system plumbing including pump and air pump sizing recommendations. This is the 2nd manual that goes with the Rail Bed System Build manual. Here it is for those who haven’t been able to attend any of my classes. I have made the electronic version of my Plumbing and system layout manual available. Basic Aquaponic Plumbing and System layout. 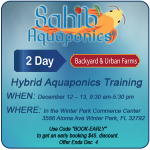 This is a good basic class to get you started in aquaponics. Only a day left to make it a reality. Really looks like a long shot now.